Benchmark Treasury yields have jumped to a new 7 years high of over 3.24% following today's strong, if weather-affected jobs report, rising at a furious speed that has prompted the biggest two-day selloff in US stocks since May. 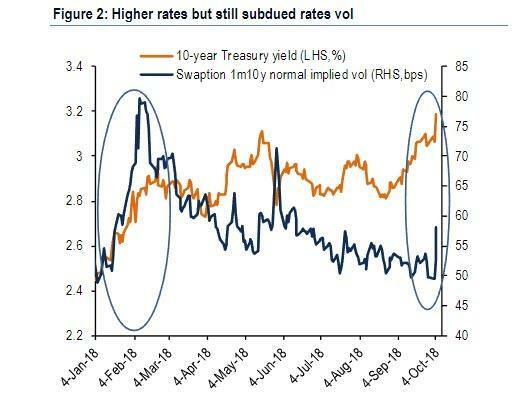 Yet with concerns mounting that this selloff would be similar to the January rout, the key difference between the current move and the one from early in the year is only modestly increasing rates vol this time, suggesting investors perceive interest rates will soon stabilize at the new higher levels, especially since if yields rise too much there would be significant stabilizing foreign buying in the back end of the curve. However, one Treasury trader has made a big that this week’s selloff is just the beginning. According to Bloomberg, on Thursday afternoon a buyer of Treasury put options wagered $2.5 million that 10-year yields will rise 3.6% over the next two months; the bet expires two days after Fed's December 19 meeting. According to Edward Bollingbroke, the 18,000-lot put block was bought at 9 ticks, when the 10Y rates was trading at roughly 3.19%. And with the yield rising above 3.24% on Friday afternoon after the payrolls report, the bet was already almost $1 million in the money. The trade, which showed up as new risk in CME open interest data, was proof that demand is starting to emerge for protection against a significant run-up in yields through year-end. Furthermore, the wager is the first major put purchase in the January 2019 expiries, and could lead to many more similar trades in the coming days. It's not just the January expiry that has been attracting attention: hedges have also been purchased in the November puts, targeting a much faster Treasuries selloff, and per the Bloomberg report, open interest Thursday surged by a combined 233,132 lots across strikes. After breaking out from their multi-year base, and springing higher, the recent bond market shakeup has left traders listening to Gundlach who predicts a sharper rise now that the resistance level has been breached, and running to find cover for a continued march higher in yields. 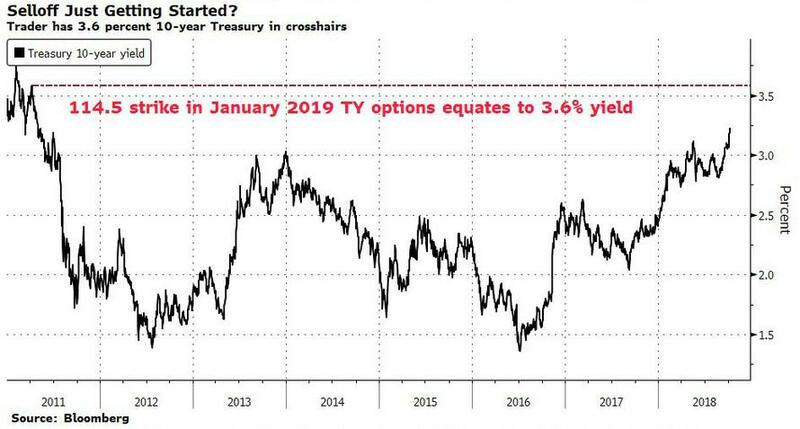 Incidentally, if Goldman and UBS are right, and Treasurys indeed tumble as much and as fast as the trader believes they will, the result would be a rout in the stock market, which begs the question: is a levered Treasury short the cheapest way to hedge against a market crash?